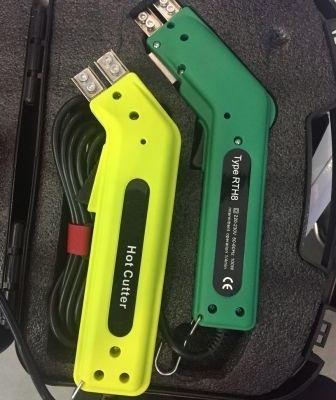 Hand-operated heat cutting tool to cut small quantities, recommended for short-time operation only. Used to cut and seal the edges of synthetic material to prevent fraying and unraveling. 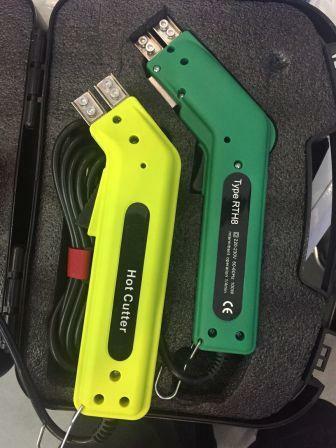 Hand-operated heat cutting tool to cut small quantities, recommended for short-time operation only. Used to cut and seal the edges of synthetic material to prevent fraying and unraveling. Such as synthetic fabric, fiber, cords, ropes, webbing, and belting. Heat up time of a blade, approx. 6-8 seconds. Blade heat may be roughly controlled by depressing/releasing the trigger.